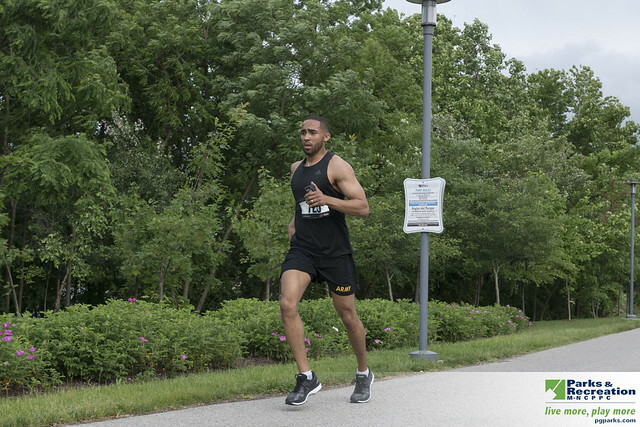 The Department of Parks and Recreation encourages runners and walkers of all abilities, ages, and skill levels to come together, enjoy the outdoors and be active in our natural park settings. Healthy Trails events are held in the spring and fall. We hope to see you at our next Healthy Trails 5K! The Healthy Trails 5K events are family friendly walk/runs held twice a year at the National Harbor. Whether you’re racing to beat your fastest time, or taking a stroll to enjoy the view, this event has something for everyone! Race bib and t-shirt pick-up is on the day of the event. A performance t-shirt is included for all pre-registered participants. Participants must be present on race day to receive a performance t-shirt. If quantities remain, performance t-shirts will be available for on-site race day registrants on a first-come, first-registered basis. Click here to view our next Healthy Trails event. For more information, call 301-446-6838, TTY 301-699-2544 or e-mail wellness@pgparks.com. Events may be cancelled due to inclement weather. Please call 301-927-0822 prior to the event for weather-related cancellations. The Department of Parks and Recreation encourages and supports the participation of indThe Department of Parks and Recreation encourages and supports the participation of individuals with disabilities. Register at least a minimum of two weeks in advance of the program start date to request and receive a disability accommodation.